Alberta today confronts many policy challenges, including the issues of royalties and taxes, the pace and scope of development, the challenge of diversifying economic growth, and the need to promote a healthy society and environment. No less important, however, is the process by which decisions are made about these issues, including opportunities for and the degree of citizenship engagement. This report uses public opinion data collected by the Population Research Laboratory at the University of Alberta in June 2012 to examine citizens’ views on governance in Alberta. It addresses respondents’ opinions on popular democracy, political alienation, the workings of government, and democracy. It also gauges support for specific types of possible changes to the political process. Responses are analyzed in relation to voting preference, region, educational attainment, gender, age, and home ownership. Where instructive, results are compared with responses to similar questions included in the authors’ 2003 study of democracy in Alberta. Despite key differences, principally related to distinctions of region, educational attainment, and age, the study finds important commonalities in Albertans’ views on the political process. For example, Albertans of all political stripes remain strongly supportive of electoral voting. This result stands in marked contrast with Alberta’s pattern of decreasing voter turnout. While the precise causes of this contradiction are unclear, requiring further research, the finding of strong public support for election spending limits provides one possible explanation. Perhaps many Albertans view the electoral playing field as uneven, favouring big money interests over fair political competition, and limiting opponents’ abilities to speak out. 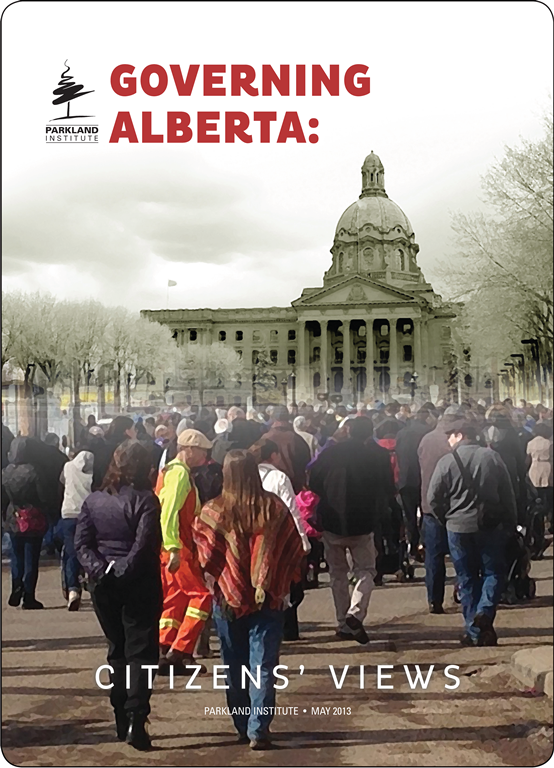 High levels of political alienation are also evident in other aspects of Albertans’ responses. Except among governing party supporters, there is a sense that their concerns will not be heard. This result should be of concern to all Albertans. Political alienation, perpetuated over time, is corrosive of democracy and the legitimacy of government institutions. Albertans are keen to find solutions to perceived problems in government. There is strong support for some traditionally populist measures, especially direct voting, and – perhaps surprisingly to those viewing Alberta from afar– strong support also for the importance of protest groups in democracy. Governing Alberta: Citizens’ Views raises serious questions regarding the state of democracy in Alberta. The importance of these questions is redoubled by the challenges facing the province at this time, such as reform to systems of taxation and royalties collection, the imperative of economic diversification, and the need for environmental protection. The study results suggest provincial decision-makers should think not only hard about specific policy directions, but also about how to re-engage the Alberta public in the political process.